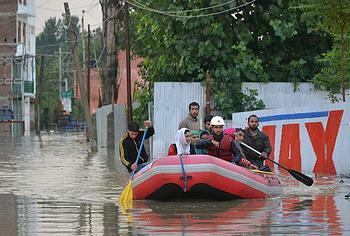 After three days, thousands are still trapped on rooftops, and a massive rescue and evacuation operation by the National Disaster Response Force and the Indian Armed Forces in the flooded Kashmir valley is in full swing with more helicopters, boats and rescue materials pressed into service today. The city of Srinagar, the capital of Indian-administered Kashmir, is inundated and so are more than 2,000 surrounding villages. Power is down, bridges washed out, and roads are impassable in much of the region. The hardest-hit area in Pakistan is the Punjab province, where the Chenab, Ravi, Sutlej, and Jhelum rivers are bursting their banks. 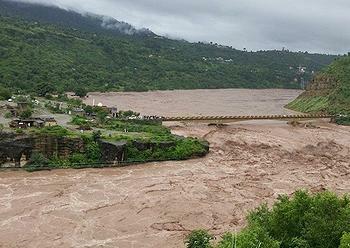 At least 193 people have lost their lives in Pakistan, and flash floods have destroyed thousands of homes and displaced unknown numbers of residents. Together, thousands of responders from the Indian Armed Forces and National Disaster Response Force have rescued 47,227 persons in different regions of Kashmir, and the rescue operation continues. “The damage is shocking,” a senior official from India’s National Disaster Response Force told reporters in New Delhi. Requesting anonymity, the official claimed to have been taken by surprise by the torrential rains and flash floods. India’s meteorological department had forecast heavy rain in Kashmir last week, but the Central Water Commission, which issues flood advisories, has been slammed by Indian media for not warning the mountainous state. Air India has declared free passage for the tourists trapped in Srinagar. To provide medical aid to the flood survivors, 80 medical teams of the Armed Forces Medical Services have swung into action. The Ministry of Petroleum & Natural Gas has taken steps to ensure availability of essential petroleum products in the aftermath of floods in Jammu & Kashmir. The availability of petrol, diesel and LPG has been brought to near normal in the division of Jammu, ministry officials said. The situation in Srinagar division is challenging and efforts are being made to make sure that adequate fuel is made available at the earliest opportunity. “There is adequate stock of petrol, diesel, kerosene and aviation fuel in the depots of oil marketing companies in Srinagar which will be immediately moved to the retail outlets once the roads become motorable,” the ministry promised. The liquid petroleum gas plant of Hindustan Petroleum Corporation Limited is inundated with flood waters. Alternative arrangements are being made for bottling LPG cylinders in Srinagar and trucks with LPG cylinders have been dispatched from Leh to Srinagar because the Jammu to Srinagar route is blocked. Five task forces of the Border Roads Organisation, including 5,700 personnel, and 15 engineering task force teams are working to restore area roads. More than 375 tank trucks carrying petroleum products have been positioned for transporting petroleum products from Srinagar to Jammu as soon as the Jammu-Srinagar route is cleared. Today, India’s National Crisis Management Committee chaired by the Cabinet Secretary Shri Ajit Seth stepped up the provision of supplies dispatching 125,000 packets of biscuits, 100,000 liters of water and 150 tons of ready to eat food from Hyderabad. Three tons of milk in tetrapacks and powdered milk are being rushed to survivors. Over 250 boats have already been deployed, and now more inflatable boats and fiberglass boats with outboard motors are being sent to the flooded area. Over 30 aircraft and 31 helicopters have been made available. Heavy duty submersible pumps are being flown in to pump out water once the river level starts subsiding. More than 6,000 solar lanterns are being mobilized in view of the disruption in power supply in the Kashmir Valley. The monsoon rainy season lasts from July through September. Monsoon rains begin to recede from northern India at the beginning of October.